Penny's racing owner is one of our group's volunteers. Penny retired in November and she has been in their home since then so she is home acclimated. Her racing owners had hoped to be able to keep her as a pet, but aren't able to due to their work schedule. 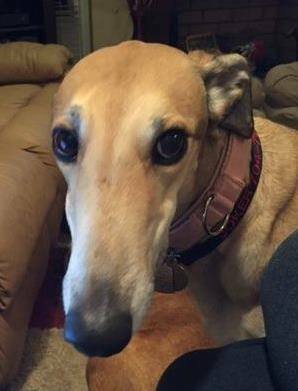 Penny raced at Tri State in WV and then Sanford Orlando. She got up to Grade A briefly at both tracks. She has 81 races to her credit and will turn 5 on August 3rd. Her sire is the famous Dodgem By Design and her dam is Flying Exorcist. She is a confident, friendly, happy girl that is energetic for a greyhound. She would love an active home that would hike, take walks or jog with her sometimes. Penny loves to play ball and frisbee and she would love to have a nice yard where she could run around and play with her family. She gets along well with other dogs. We have her marked as older children only because she is can be bouncy and playful and might knock over a toddler or smaller child. She has a lot of personality and is very sweet.